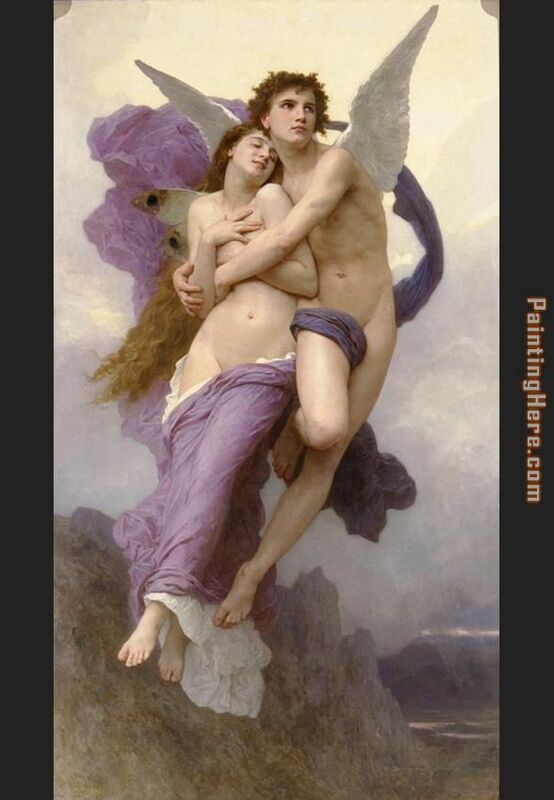 "This is one of Bouguereau`s more romantic pieces. With Psyche finally in the arms of her love, Cupid, the two ascend to heaven. The subtle use of color is truly astonishing. The light and dark purples of the cloth surrounding Cupid and Psyche play beautifully against the purple grey clouds and mountains. The myth of Cupid and Psyche dates all the way back to Apuleius in the 2nd century AD. In the myth, Psyche is a beautiful princess of whom the goddess Venus is jealous. In her rage she orders her son cupid to make Psyche fall in love with a monster, but Cupid falls in love with her himself. After several trials Cupid and Psyche make their plea to the gods who turn Psyche into an immortal and allow them to be married in heaven (British Library). The story of Cupid and Psyche was a subject matter for several of Bouguereau’s paintings including Cupid and Psyche as Children (1889), Psyche and Cupid (1896), and Psyche." Beautiful, original hand-painted artwork in your home. Interpreted paintings based on the masters' works of William Bouguereau.This The Rapture of Psyche needs about 14 - 16days for production by a talented artist. If you're not happy with William Bouguereau The Rapture of Psyche that you made on PaintingHere.com, for any reason, you can return it to us within 50 days of the order date. As soon as it arrives, we'll issue a full refund for the entire purchase price. Please note - PaintingHere.com does not reimburse the outgoing or return shipping charges unless the return is due to a defect in quality. If you want to purchase museum quality The Rapture of Psyche at discount price, why not give us a try? You will save a lot more! This William Bouguereau The Rapture of Psyche needs 14 -18 days for production time frame. We ship all over the world. We can provide The Rapture of Psyche Painting stretched canvas and large framed art.